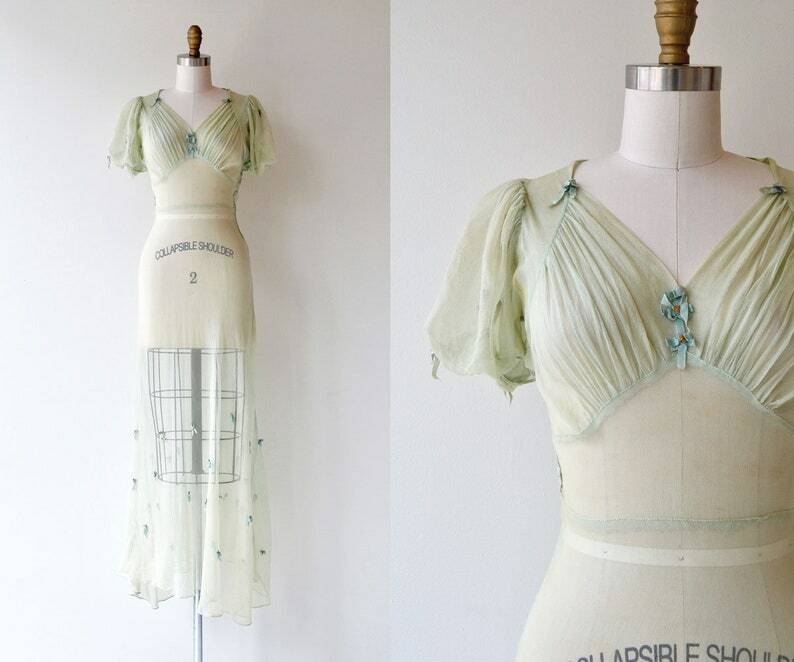 Vintage 1930s very pale celery green silk net dress, sheer with gathered bust, teal applique flowers, gathered shoulders, short balloon sleeves, bias cut with some stretch and side snap closures. ✩ Layaway is available on select items. Please send a convo if you are interested in setting up a payment plan for an order. Michigan residents will need to add 6% state sales tax. Though all sales are considered final returns are reviewed on a case by case basis, primarily only if there was a significant error in the listing. Shipping charges are non-refundable. Because great care is taken to provide accurate measurements on each garment, returns due to poor fit are not accepted. Returns are subject to a 15% restocking fee. Items from the 1920's and earlier are non-returnable due to their fragile nature. To ensure your item is well suited for you, please read the vintage sizing information below & double-check and compare the listing size and your own size to get the best fit. If you are unsure and have a question about the size or appearance of an item, contact me and I will gladly send you more pictures or take additional measurements. It is important that you love your Dear Golden purchase! Vintage garments were often tailored to fit an individual woman and evidence of seams and darts being taken in or out is not uncommon. For this reason, it is often possible to have a vintage garment altered to fit you if your measurements are off by just a bit. I am happy to answer any questions about available seam allowances, darts, and hem allowances before you purchase. If you have any other questions or concerns, please send a message before purchasing. ✩ International: please allow 3-6 weeks for delivery. Internationsl buyers, please note that you are responsible for all VAT, import fees and taxes imposed by your country. If you would like to add insurance to the shipping of your item, please let me know prior to making payment and i will adjust the shipping cost to reflect the cost of insurance. outside of this DEAR GOLDEN is not responsible for lost packages. ✩ DEAR GOLDEN is not responsible for lost packages. All domestic packages are shipped with tracking & international packages are mailed First-class International mail or Priority Mail (upon request) & both are tracked until the package's departure from the United States. Once a package has left the U.S. the package is no longer tracked. Reserves/holds are available for 24 hours. If you need more than 24 hours please contact me. For reserves longer than 24 hours a non-refundable deposit is required. Please do not reserve an item if you are not 100% sure you will purchase it. DEAR GOLDEN also has the right to refuse a reserve request. ✩ All of the items at DEAR GOLDEN are vintage so there is some wear. They may not be 100% free of minor defects, as they have been loved already. Any imperfections are minor and are described to the best of my knowledge. Layaway is offered on a case by case basis and most generally on higher priced items. A non-refundable deposit is required and payment is generally due in full in 30 days.